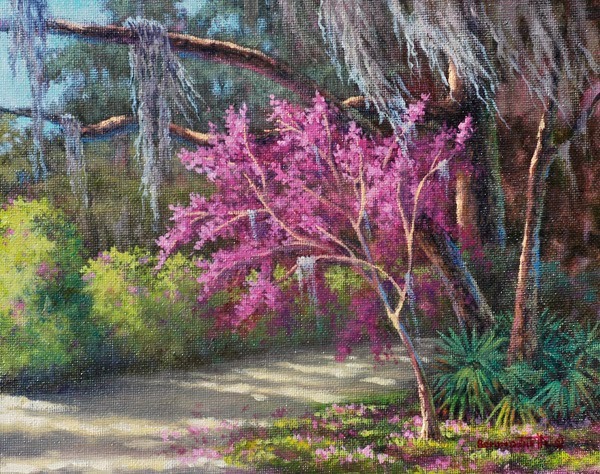 "Red Bud Tree and Live Oaks"
Christmas is just around the corner. So, I am speeding up the auction so more paintings can be offered. This first painting will be available until 8 PM Wednesday, December 11. 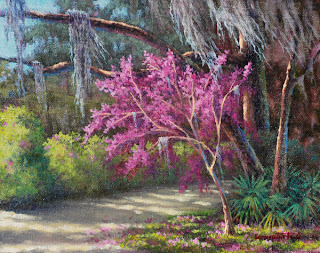 "Red Bud Tree and Live Oaks" was painted en plein air (on site) in Micanopy, Florida. It is 8" x 10", oil on canvas board. The auction started yesterday, Saturday December 7 with the beginning bid of $.99. The current high bid is $100.00. Bids may be raised in any increment until the last hour----7-8 PM Wednesday, December 11 all bids must be a minimum of $5.00 higher than the last. Contant jackie@jackieschindehette.com with your bid. I don't know how it happens but I am always caught off guard, and am amazed to wake up one morning and find that I am in the middle of the holiday rush!!! This year I vowed for that to not happen and started painting my ornaments early and accumulated 4 ornaments of 6 different images. I was all set. The GOOD NEWS is that the Backus Museum in Ft. Pierce, Fl. on the east coast contacted me and ordered 2 dozen for their Christmas Extravaganza. The BAD NEWS is that after shipping them off to the Museum I didn't have any left for the new orders coming in. Or is THAT the GOOD NEWS? Oh well, the BAD news is that I am back in the studio spending long hours producing more ornaments. But the GOOD NEWS is that I thoroughly enjoy painting them and am having fun. I am hearing from many collectors and that is ALWAYS GOOD NEWS. If you would like to place an order just email jackie@jackieschindehette.com Tell me which bird or birds and how many ornaments you would like. The bulb color may be different from what is pictured here. 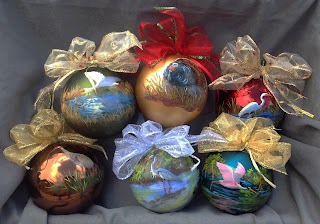 Each hand painted 4 1/2" bulb comes with a lovely gift box and is $40.00 plus Fl Sales Tax (if you live in Fl) and shipping. My exceptionally fun summer did not end with Franklin, NC. When I got home from NC I unpacked, washed clothes, repacked and headed to Marathon in the Keys. Of course, there isn't much to pack when you are in a bathing suit all day. Harry, my son David and his family and I joined my brother and other family members to go "Lobstering". 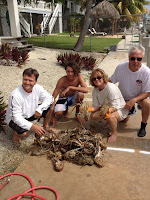 As you see in this photo we succeeded in catching our limit (4 per person in the boat per day). Not everyone looking for lobster on the ocean bottom finds them. My brother, Don, is an exceptional fisherman. He has "lobstered" for many years in the water around Marathon and knows where to go in that great big ocean to catch the limit each day. It was great to be with family! 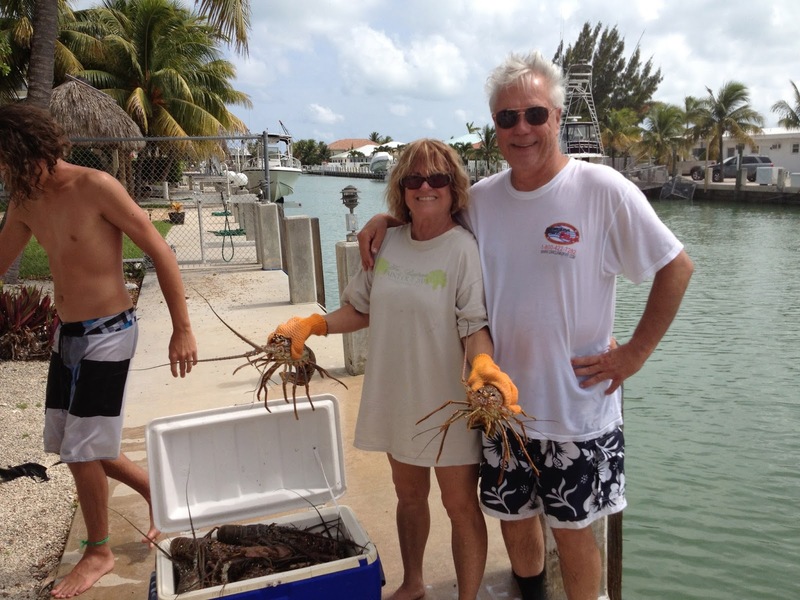 And great to have a lobster feast with all the trimmings prepared by my super sister-in-law Nancy. 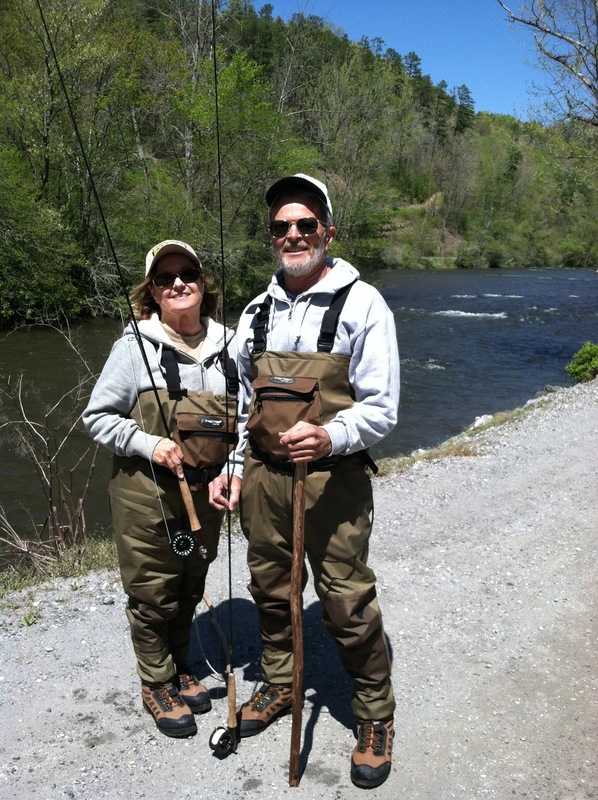 Harry and I learned to Fly Fish while in Franklin this summer. I have always thought this would be great fun so we gave it a try. And guess what? I was right!!! It is wonderful to be outdoors in such a beautiful setting, water rushing around your legs with mountains in the distance. THAT was the fun part. The UNFUN part was trying to walk in rushing, icy cold water on slippery rocks dressed in boots and waders. But I am proud to say I didn't fall in!!! We didn't catch anything but I can't wait to do it again. School has started and somewhere I know a teacher is asking students to write about what they did during their summer break. So, I too, will write a little bit about what I did this summer. My husband and I scouted out and found a lovely campground in Franklin, NC. We rented it for the year and spent most of the summer there. It was cooler than Florida, not as muggy and fewer bugs. We have a 32 foot pull camper trailer with all the necessary elements: beds, kitchen, dining table, bathroom, etc. ..all the comforts of home....yep, even air conditioning. This is a very small camp ground with just 14 camp sites. The river is just a few feet from our camper so I can hear the water moving along and enjoy seeing people in inner tubes float by. I spent a lot of time sitting by the river reading during the day and then watching fire flies/lightening bugs in the evenings. 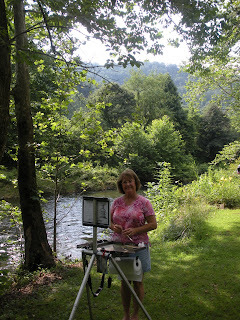 We did a lot of sight seeing, played tennis, kayaked and I even painted a little. It was a delightful summer. Now I can't wait for the fall and watch the leaves change color. Congratulations to Pat for winning last weeks auction painting "Yellow Hibiscus"
This weeks painting is "Pink Hibiscus"with frame, 5" x 7" painted in oil, last of the set of three. Bidding starts at just 99 cents with no reserve. Get your bids in before the deadline of 7 PM EST, Wednesday July 3. Email your bid to jackie@jackieschindehette.com and write "Auction" in the subject line so I will be sure to open it immediately. I notify all bidders when a higher offer is bid. A number of offers come in the last few minutes before the deadline so, ties are broken by the time stamp on the email. Some collectors have been disappointed when they have been outbid the last few seconds because there is not enough time to notify them of a higher bid. My only suggestion is to offer the highest bid you are willing to pay so there is less chance of your being outbid the last second. But.....the most important thing is HAVE FUN!!! Hibiscus of all colors are found in Florida. I personally think they should be the State Flower. The blooms open in the morning and close at night. If you want to keep the flower open just put it in some water and set it in the refrigerator. It will stay open all night and is still beautiful in the morning. 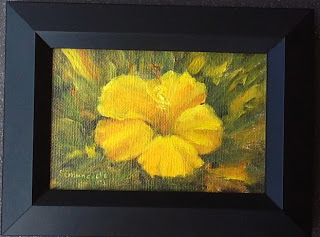 "Yellow Hibiscus" is my auction painting this week. Bids open at just 99 Cents. You may offer bids until 7 PM EST. Wednesday, June 26. 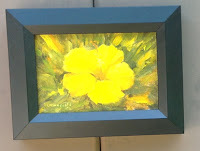 I am holding my weekly auction of miniature oil paintings again. 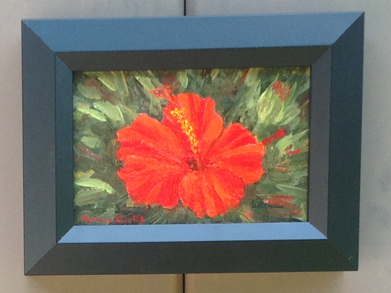 This "Red Hibiscus" is the first on the auction block. 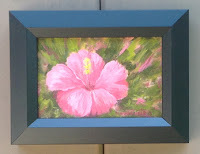 The painting itself is 5"x7", and comes with the frame and FREE shipping. Bidding starts at just 99 cents. Yep, you can add an original painting to your collection...or give to someone special...for very little cost. Email your bid to jackie@jackieschindehette.com Write Auction in the subject line so I will be sure to open it right away. You will be notified if you are the high bidder or need to up the ante. This weeks auction ends 7 PM, Wednesday June 19. Bidding ties are broken by the earliest time stamp on your emailed bid. In the coming two weeks I will offer a Yellow Hibiscus and a Pink Hibiscus painting. All three are framed alike so bid on just one or try to get all 3 in the collection. 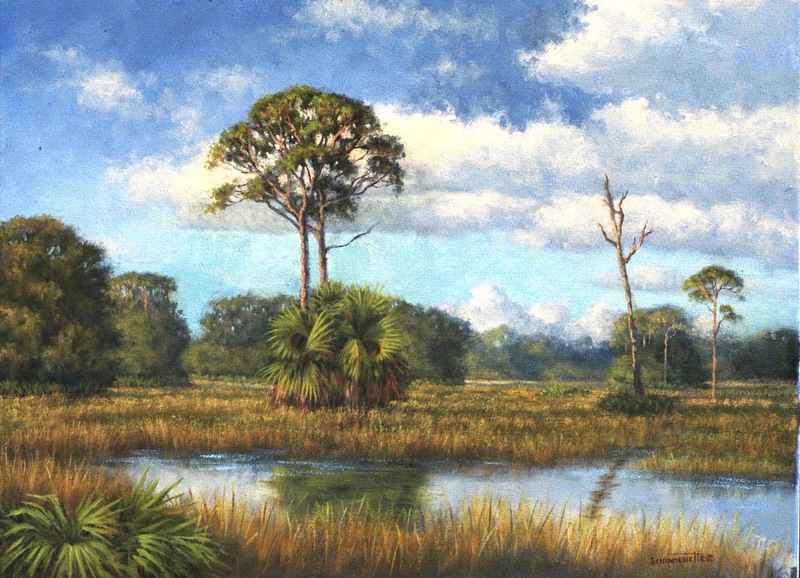 Thank You to Janie and Ronald for adding "Gone Fishing" to their personal collection during the Santa Fe College Spring Arts Festival in Downtown Gainesville, Fl. this past weekend. It was a wonderful show and the weather could not have been better. Lots of people turned out to enjoy the spring atmosphere and to add art of all types to their homes. 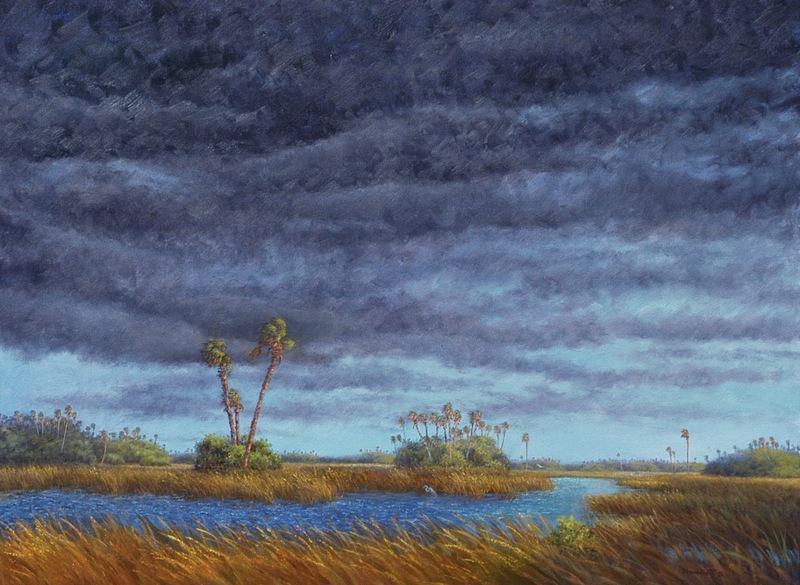 "Cedar Key Sunset" also found a new home. Thank You Ann and Tom for adding my work to your personal collection. Exhibiting at outdoor Art Festivals takes a lot of planning and physical work. Top shows like this one jury their artists 6 months in advance. Artists arrive at the "crack of dawn" the first morning of the show to set up the tent and install all the artwork. Yep, we just sit around during the show, often in the rain, cold, heat, or howling wind. It IS fun to meet all the folks that come by, and of course, a delight to talk about our art work. Then it is time to break it all down, pack up the truck, drive home and then....unload it all. Don't think I am complaining....I am just explaining how it works. I choose to participate in these festivals because I thoroughly enjoy seeing long time friends and collectors, making new friends, some of whom become collectors, and seeing the smiles my work brings to people. This is the last show for me until next October at the Fine Arts for Ocala Festival. The show is moving to downtown Ocala, which will bring a home-town feeling to it. All are welcome to email or call me to visit my studio/gallery and see new works as they come off the easel. My last show until next October is this coming weekend at the Santa Fe College Spring Arts Festival in Gainesville, Florida. I am fortunate to have been juried into this highly respected show once again. My Booth #412 is on NE 1st Street between NE 4th and 5th Avenues. The Festival is April 6, Saturday 10 am - 5:30 pm and April 7, Sunday Noon - 5:30 pm. The painting shown here sold to a private collector but I have Fine Art Giclee Hand Embellished Reproductions on Canvas of it as well as over 25 other images to chose from. 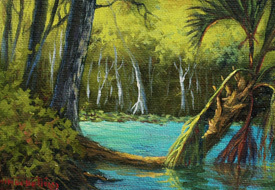 As always, a wide variety of sizes and scenes of original oil paintings will be available. And, I have painted a large collection of miniatures that are great to add to personal collections or use as gifts. See you at the show! If you can't make it call or email me for a visit to my studio/gallery in Ocala, Fl. Many of you may already know that I am a Florida native and love the warm sunshine in my home state. What you may not know is that I also enjoy snow skiing. 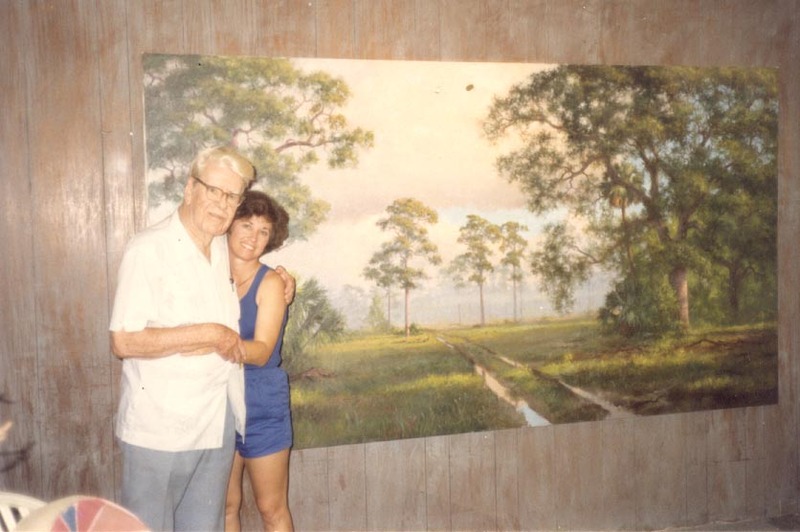 My husband and I lived in Utah for a few years prior to moving to Ocala,Fl. (That is another story for another time) While there we skied most of the western slopes. 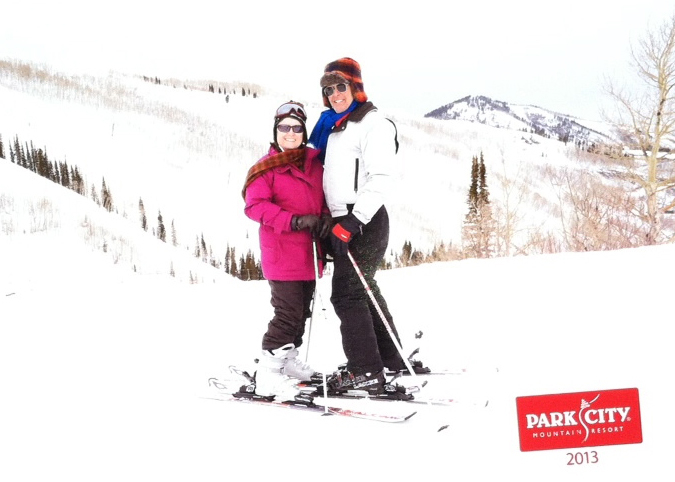 So, it was great to join my sons and their families last week during the school Spring Break for a week of skiing at Park City, Utah. We rented a house in Park City big enough for all of us with ski in-ski out ability. That means we didn't have to lug our gear to the slopes and back. We could just walk out the door, put our skis on and go. Spring skiing is always a gamble because temperatures are rising and the snow is beginning to melt. We got lucky and had snow fall the first two days, creating good skiing conditions. The two older grandchildren (14 and 9) had not skied much but got their "ski legs" by early afternoon the first day and were off to the top of the mountain. The youngest, 3 years old, did great also and enjoyed skiing with his dad and grandpa. We took a day off and went "tubing". What is that? you ask. You get hauled up a slope, jump onto huge inner tubes, slide over the crest and down you go, full speed ahead. Of course, we all had to go together, making it even more fun. If you want a good laugh go to my FB page to see a video of us fools sliding down the mountain. The A. E. Backus Museum invited me along with a few other artists to participate in a unique fund raiser. Each artist selected an object and painted what ever they wanted to on it. I chose a lovely solid wood tray. After sanding, the wood took on a beautiful patina that yelled SANDHILL CRANES to me. 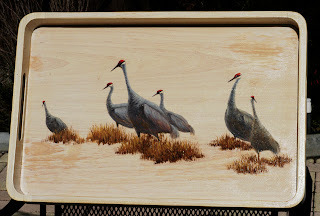 The images are painted in oil, which worked well with the wood grain, giving the "feathers" a more real look. After the paint was completely dry I applied a wood varnish that is used on salad bowls. As a result, food can be served safely right on the tray. The Museum Director Kathleen Frederick called to tell me how the auction went. I am thrilled my tray was sold for $475.00 with all the proceeds going to the Museum. Commissions are great because they offer challenges I might not otherwise undertake. This collector wanted an ominous, threatening sky filled with dark clouds and strong wind blowing the tall saw grass and sabal palms. I usually choose to paint beautiful skies and balmy weather so developing this painting stretched me in a different direction. The quickly drifting clouds allow sunlight to shine brightly on the grasses one minute and then into darkness the next. 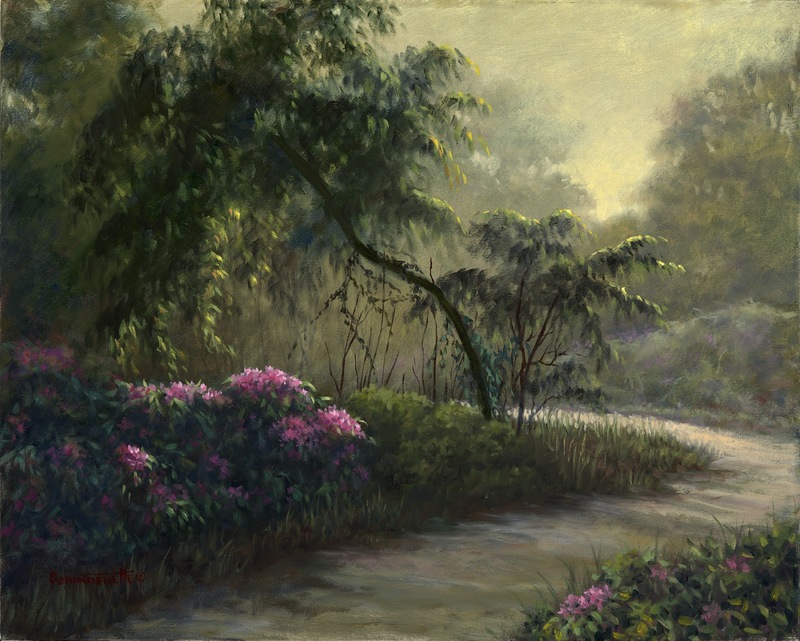 The cloud shadow on the lower right corner of the painting, as well as in the distance, makes the sunlit grass even more bright by contrast. 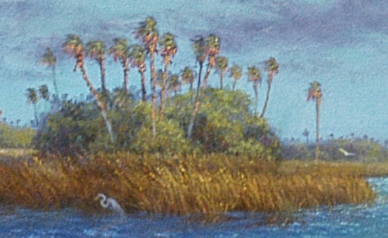 The close up of the cluster of palms shows a white egret huddled in the shadow of the saw grass using it as a wind break. Another egret flies off into the distance in search of a quieter place to hide. Years ago, while living in Ft. Pierce, Fl on the east coast I drove around Lake Okeechobee through Immokalee down to Naples to visit my parents lots of times. As often as not I saw this very scene on many of the those trips so this painting resonated with me. 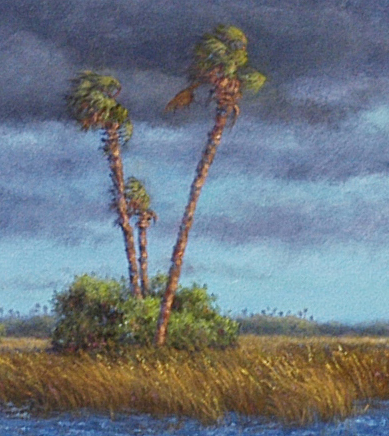 Wind blown sabal palms are fun to paint. They are very tall and "gangly" causing them to sway in the wind. The fronds blow in pretty much the same direction with the wispy ends whipping in all directions. I had such fun with the painting! I think I captured the essence of the moment. Let me know what you think. For me, a painted study for large paintings is crucial. Pencil sketches help me develop the composition after the subject of the painting is decided. From these sketches one is chosen for the study that satisfies all the compositional criteria and "tells the story" I intend to communicate to the viewer. 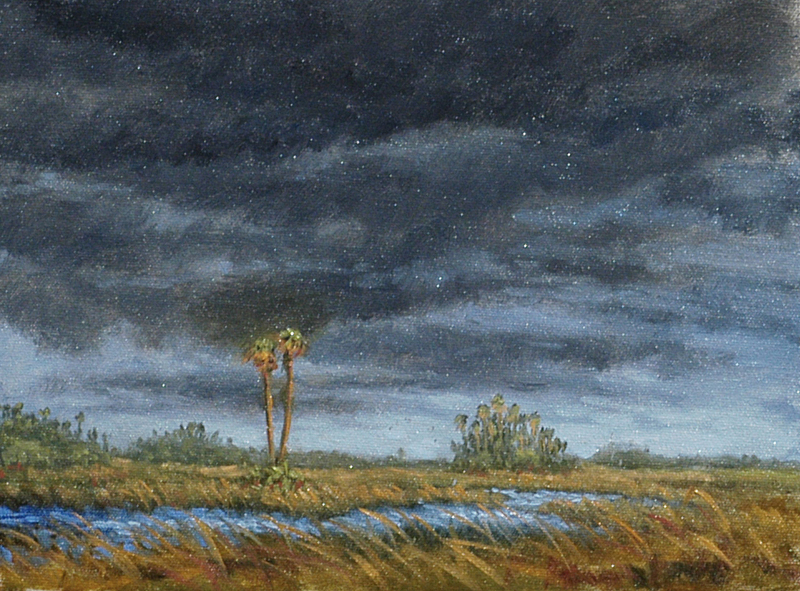 After discussing, at length, what type of scene this client wants in his commissioned painting we decided on a dark, brooding sky filled with ominous clouds with stands of Sabal palms and sawgrass blowing in the wind. He and I both lived in Miami, Fl and are familiar with the storms that blow across the Everglades, so this was a perfect fit for us both. The study posted here is 9"x12", which is 1/4th the size of the final painting (36"x48"). The client has approved the study, the canvas is on my easel, and I am anxious to get started. The Artist Reception for the "Tribute to Backus" at the Backus Museum and Gallery last Friday night in Ft. Pierce was a huge success. The Museum was packed with people arriving before the official opening time and not leaving until well after closing. It was great fun to see long time friends and reminisce about the past. I lived in Ft. Pierce for almost 20 years, so there are lots of stories to remember. However, the night was about Bean and I thoroughly enjoyed sharing my personal memories about him with people new to the area. The paintings were not only on exhibit but also for sale with a portion of the proceeds going to support the Museum. These are two of the 6 paintings of mine that found new homes. The show will hang until March 8 so you still have an opportunity to see it. 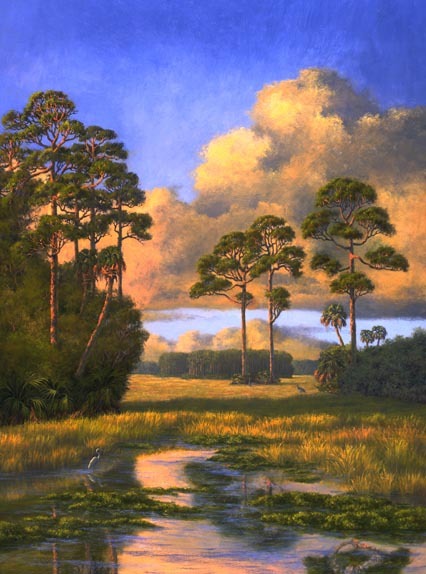 While at the Museum be sure to see the permanent collection of Backus paintings, you will understand why he is known as the Dean of Florida Landscapes. Bascom Palmer Eye Institute commissioned Bean to paint two large paintings for their hospital in Miami, Florida. This is one of the paintings. I was fortunate to have been working with Bean at the time and got to see him create these fabulous paintings. I don't know about all artists, but I get a bit intimidated when facing a very large blank canvas. Surprisingly, Bean also got a bit nervous contemplating these large paintings and procrastinated for some time. Once he got started the magic flowed through his hand. I photographed each stage as the paintings progressed but they are "old fashioned, hard copy" photographs. Hopefully I can get them into digital form and post a few. 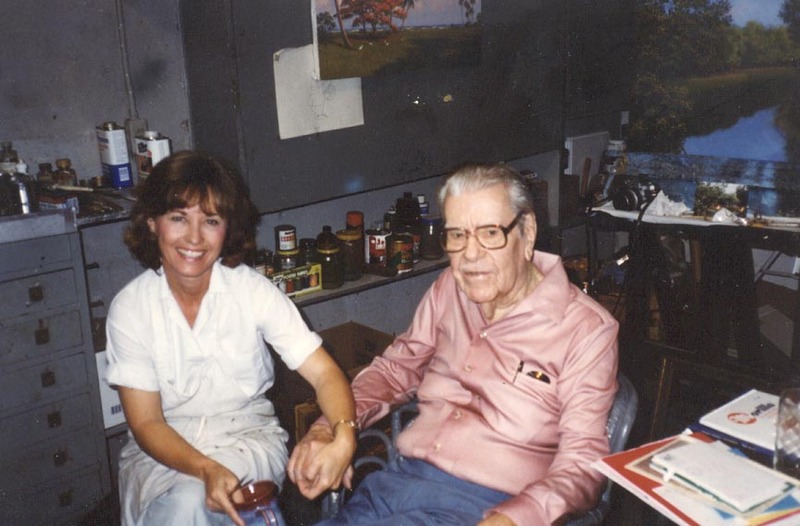 The "Tribute to Backus" Exhibit/Sale at the A.E. Backus Museum and Gallery in Ft. Pierce opens today. So, I thought it appropriate to show a few of my personal photos...and memories... of this very special man. 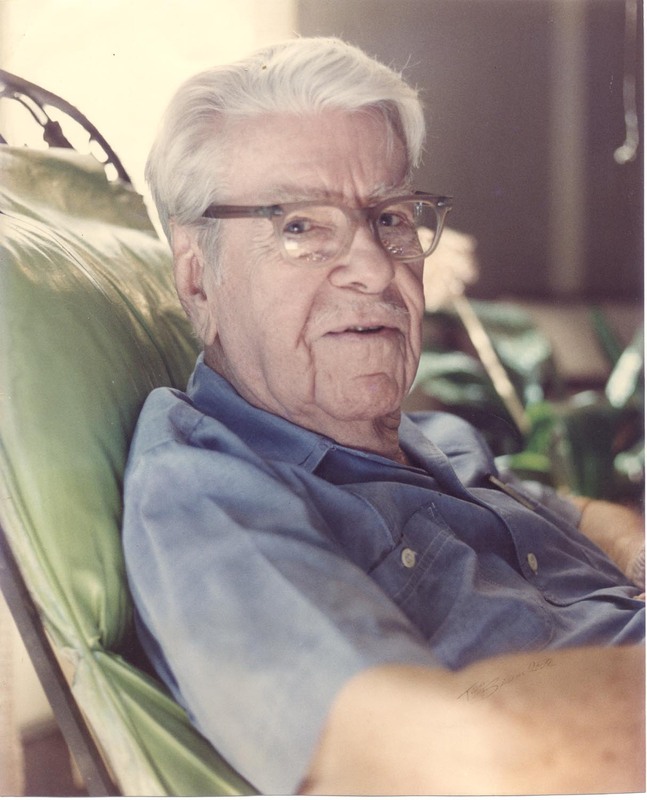 The photo on the right was taken in his home-studio in Ft. Pierce, Florida. Yep, that is me with Bean. I remember the day well. We both were painting all morning and sat down for a while to chat and listen to his jazz records, Bean's favorite kind of music. 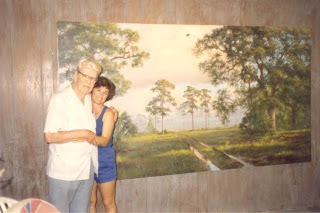 Some times he would play the music as we painted, listening for a while, then dancing together occasionally. My easel is behind Bean just over his left shoulder. Just being in the studio was wonderful, but painting with Bean was magical. I am grateful to have had this exceptional experience that progressed into a career and the gift of Bean's friendship that still warms my heart. The top photograph of Bean was taken by highly respected photographer Tom Baumker. The Backus Museum asked me to paint something on a tray for an upcoming auction with the proceeds going to the Museum. Of course I didn't hesitate to say yes.....although I have never painted on a tray or piece of furniture before. Ok, Ok, soo.... I did paint on a life sized horse ...but that was another fund raiser and another story. The Museum supplied the tray which turned out to be really neat (does anyone say that anymore?). It must have been purchased at a thrift store because it has $3.95 written on the back. What a steal! It is also marked Calvin Klein, is solid wood not plastic, and put together with dove tail joints not staples. After sanding, the wood spoke to me and yelled....SANDHILL CRANES! I didn't want to overdo the painting image and chose to keep it simple. I hope those attending the auction like it as much as I do. I might even offer a silent bid. If you want to bid get in touch with Kathleen at the A.E. Backus Museum. I was in the Thornebrook Village Art Festival last October 2012. As I was packing up to go home on the last day of the show a charming young man stopped by my tent. He raved about my work, looking at each painting and print. Well...I was ready to fold my tent and go home after being there all weekend, but made myself spend time with him and answer his questions. He emailed me a couple of days ago to ask about visiting my studio. We arranged a day and time. He was delighted to be able to see my studio and learn more about how I work. He, again, looked at all my paintings and giclee reproductions........and, yes, he selected one to purchase. Anthony went home with "Lazy Days of Summer" (shown here) and a big smile on his face. Tadddaaa!!! Just finished "Summer Solitude -- Back Country Pines", 24" x 48", this afternoon. Knowing when to stop painting is always a challenge for me. Seems like there is always one more little dab of paint needed somewhere. Or.... maybe... NOT! 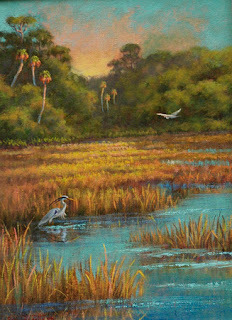 I was trying to decide if I wanted to put Sandhill Cranes or a Great Blue Heron in the landscape and opted for a single Great Blue. They are such elegant birds, I think this guy lends an air of dignity to the painting. Of course, I still have a week before I deliver the collection to the Backus Museum so,......... I have been known to paint a bird out and repaint another bird in if I keep a painting a while. I am still adding paintings to my collection for the "Tribute to Backus" exhibit/sale at the A.E. 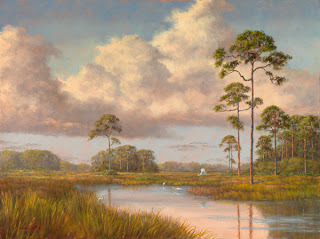 Backus Museum and Gallery in Ft. Pierce, Florida that opens Wednesday, January 16. The 24"x48" painting on my easel WILL get finished today! There are lots of things yet to do: get the stamps on announcement post cards and mail, paint a few more 4"x6" paintings, finish painting the wooden tray that will be auctioned by the gallery and schedule a time to deliver all by January 12. I took time off for Christmas and New Years and am now paying the price! Actually, I don't mind the last minute push.